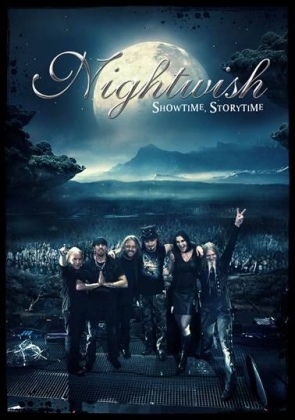 Finnish Symphonic Metal legends NIGHTWISH have revealed the cover artwork and more details of their upcoming new live DVD. »Showtime, Storytime« contains the entire NIGHTWISH headliner show, played at this years' legendary Wacken Open Air - the world's biggest heavy metal festival. The live show in the front of 85 000 screaming metalheads was directed by Ville Lipiäinen, filmed with seventeen cameras and has a total duration of 85 minutes. The second disc consists of 120-minute tour documentary 'Please Learn The Setlist in 48 Hours', also directed by Ville Lipiäinen, with no short of drama or overall madness. Also, there is a 16-minute NIGHTWISH Table Hockey Tournament, filmed on tour. On top of this there are two music clips: 'I Want My Tears Back' (Live at Hartwall Arena) and 'Ghost Love Score' (Live in Buenos Aires). The Wacken Open Air appearance was the first of the three final shows of the band's `Imaginaerum World Tour´ 2013, which saw the Norsemen and their Dutch amazon Floor Jansen (REVAMP) playing of 104 concerts in 34 different countries with total audience of over 1,5 million fans around the globe. »Showtime, Storytime« will be released on November 29th as a "Ltd. 2Blu-ray + 2CD DIGI", "Ltd. 2DVD + 2CD DIGI", "Ltd. 2CD DIGI", "2LP (coloured) in gatefold" and an exclusive "Nuclear Blast Mailorder Edition".